You can see more information about each winner on the EAT, DRINK, and DO & SEE pages. Here is a compiled list. The BOAST: Best of Astoria 2018 results have been published to the BOAST website, and you can see all the winners on the EAT, DRINK and DO & SEE pages. You can also view the winners by location on the LOCATION page with an interactive map broken into categories, with subway stop in parentheses. We have added new photos to the site, as well as new Featured BOAST Locations on the sidebar. (If you want to be a Featured BOAST Location, write to us at hello@boast.nyc.) We also have some new categories this year, including Best Bagels, Best Bubble Tea, and Best Massage. We want to thank those who filled out the survey, especially those who did write-ups, and give a special note of appreciation to businesses who donated prizes: a trucker hat from The Bonnie, a Duvel Gift box from Astoria Bier & Cheese, ticket vouchers from Astoria Performing Arts Center, a VIP pass from Q.E.D., a gift card from Astoria Coffee, and a gift certificate from Trattoria Ora. 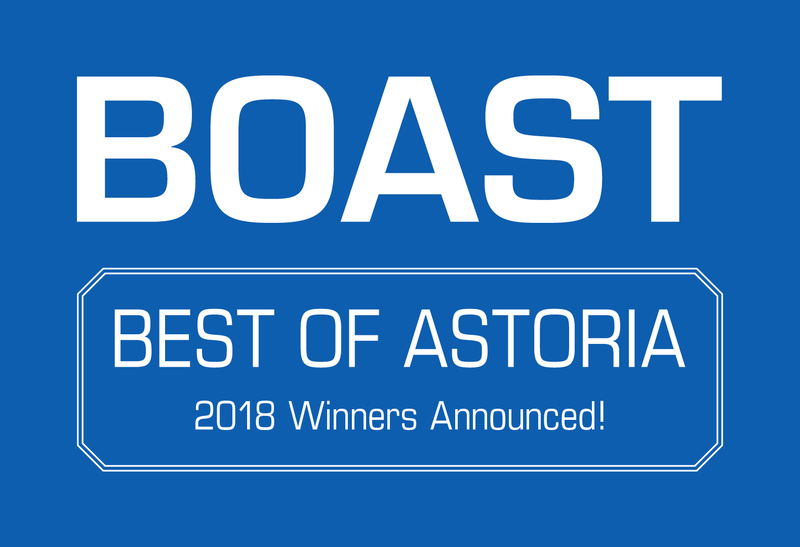 Congratulations to all the BOAST: Best of Astoria 2018 winners. These are the places that make Astoria great, and why we enjoy it so much. Can you believe it’s already the end of 2018? We think this year completely flew by. The BOAST: Best of Astoria 2017 party at The Queen’s Room felt like it was just the other day, although it was in February! But with the end of the year comes the BOAST: Best of Astoria 2018 Survey! Please fill out the form and enter your name and email if you’d like a chance to win a prize. We always appreciate short write-ups about your favorite places, but keep in mind that there are 51 total categories, so answer as many as you’d like. The survey will be open until the last day of the year, December 31. There’s been a lot of change in the neighborhood in the past year, so we look forward to seeing what your favorites are right now. The link to the survey is boast.nyc/survey, and please share with anyone who knows and loves Astoria! 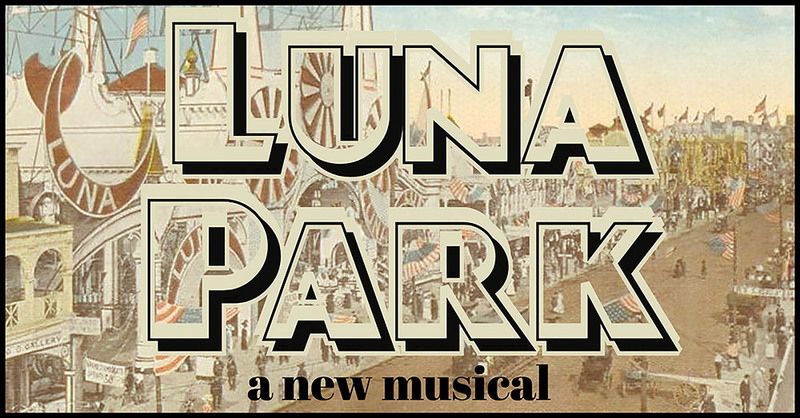 There will be performances of Luna Park on December 1 and 2. Following an acclaimed 17th season that included sold-out performances, critical accolades, and multiple New York Innovative Theatre (NYIT) Awards for its record-breaking production of Follies, Astoria Performing Arts Center (APAC) returns for its female-driven 18th season, featuring a benefit concert of Luna Park: A New Musical and two mainstage productions: the New York Premiere of Queen and the Tony-nominated musical, Caroline, or Change. Last season’s Follies also marked APAC’s final production at the Good Shepherd United Methodist Church in Astoria, the company’s former home of ten years. APAC’s benefit concert of Luna Park will take place at the RIOULT Dance Center (34-01 Steinway Street) and APAC’s mainstage productions of Queen and Caroline, or Change will take place at the Variety Boys & Girls Club of Queens (21-12 30th Road) in Astoria. The creative team behind Queens Comfort rolled out Comfortland in September. QC moved west on 30th Ave taking over the space formally housing Sugar Freak at 36-18 30th Ave. Comfortland took over the old QC location just east of Steinway on 30th Ave. The sugary creations at Comfortland made by Montana D’Alessio Barbier and Jackie Legge will keep you coming back eager to try their new baked goods. 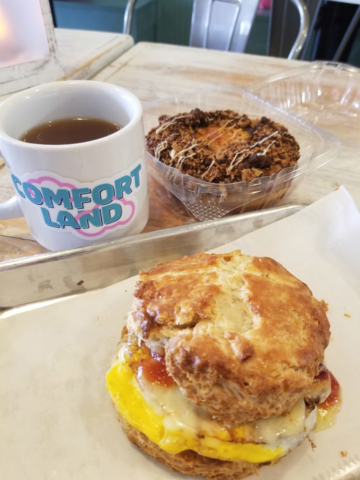 Follow Comfortland on Instagram and you’ll be counting down the days/weeks/minutes ’til your next visit. 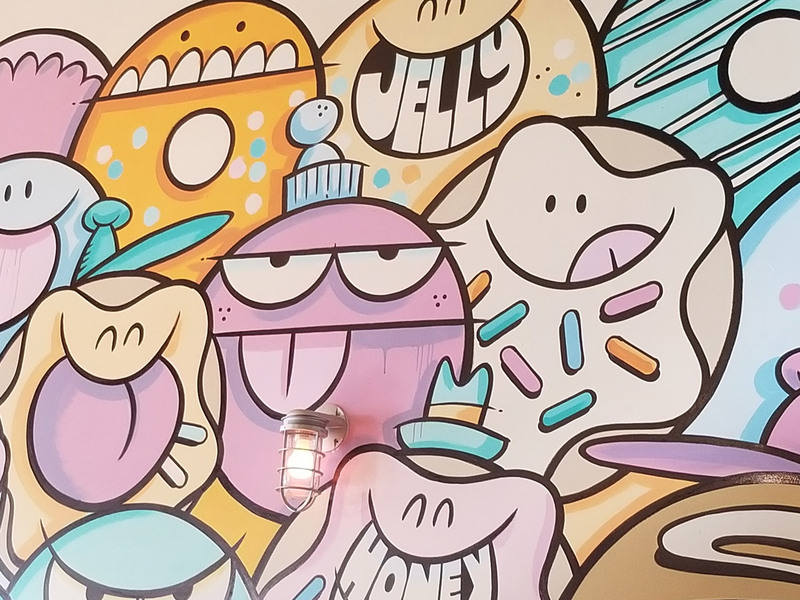 The cute donut shop ambience makes for a fun quick meal. The buttermilk biscuit sandwiches are divine. 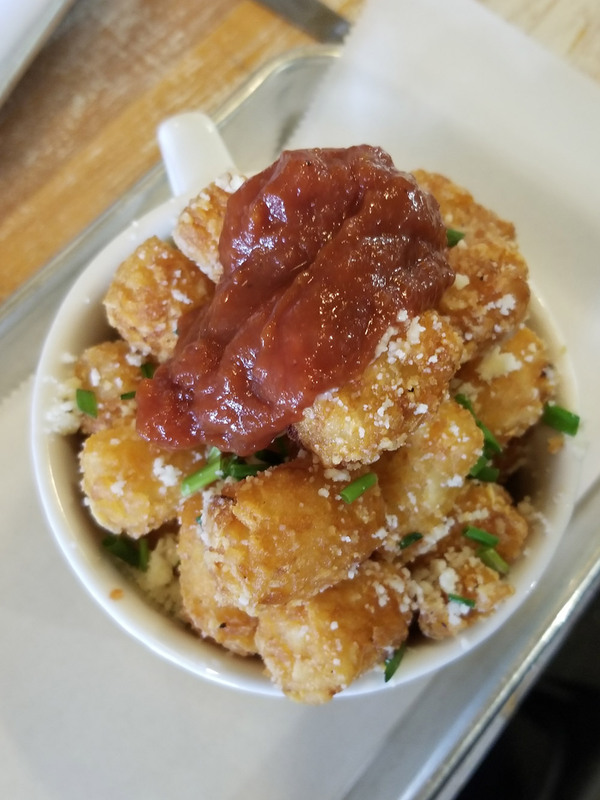 Pair it with the delicious truffle tots and take your donut to go. Your reviewer is currently too full to eat the nutella creme brulee donut now, but can’t wait to sink her teeth in it in a few hours! 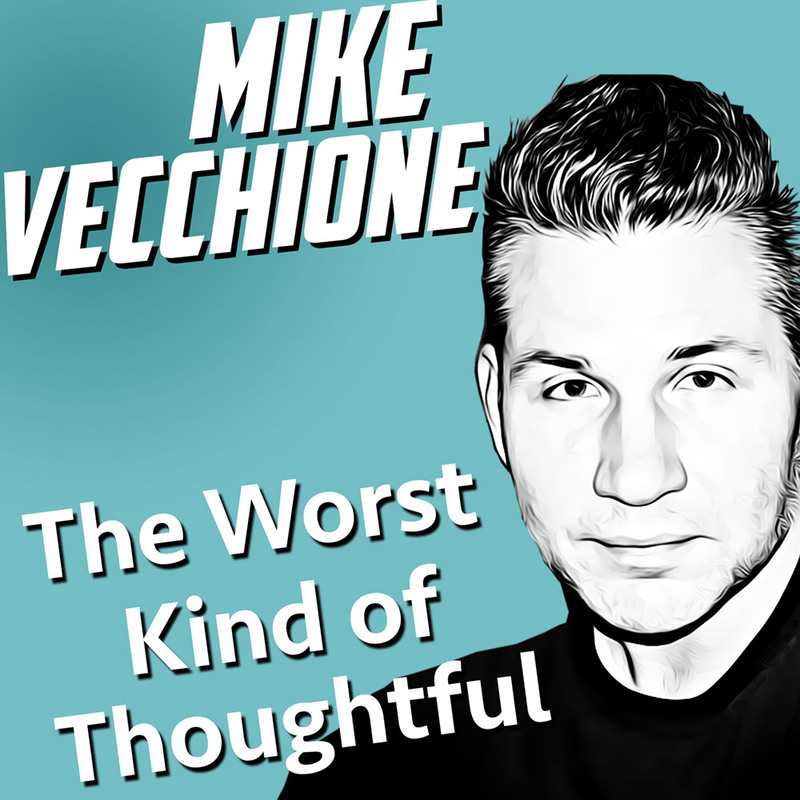 Mike Vecchione, an Astorian comedian who recently appeared on The Tonight Show with Jimmy Fallon, recently released his second comedy album, The Worst Kind of Thoughtful. Recorded live on Long Island at Governor’s Comedy Club, this high-octane comedy album from one of NYC’s top comedians gives you over an hour and twenty minutes of autobiographical stand up comedy. The Worst Kind of Thoughtful covers a wide range of personal topics including: growing up as an Italian-American in the rust belt with an overbearing father, becoming middle aged, failed relationships, dating in his 40’s, the pain and pleasure of Indian food, dealing with millennials, getting his car stolen and having to travel on a Megabus to perform his stand up comedy all while living under a train in Queens. 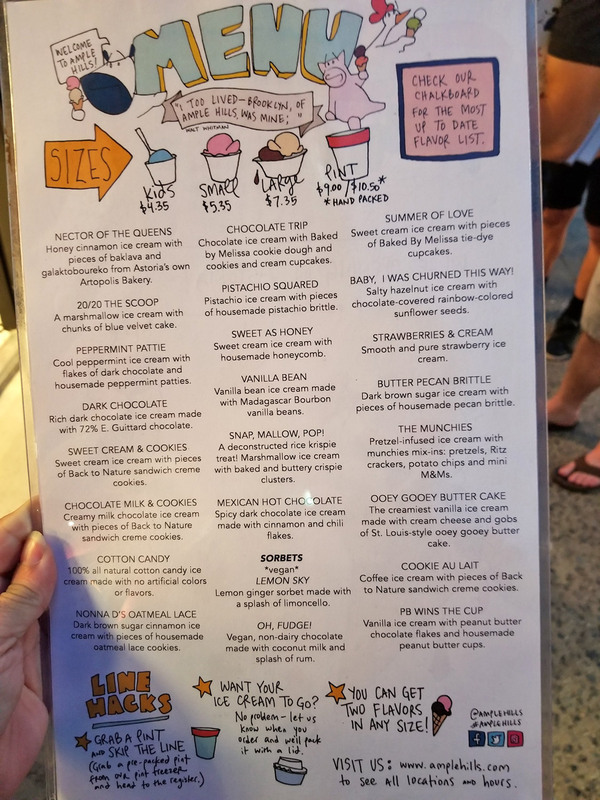 Last Friday at 4pm, Ample Hills Creamery opened on 30th Ave by 34th St, shortly after the 30th Ave N/W subway station re-opened (yay!). 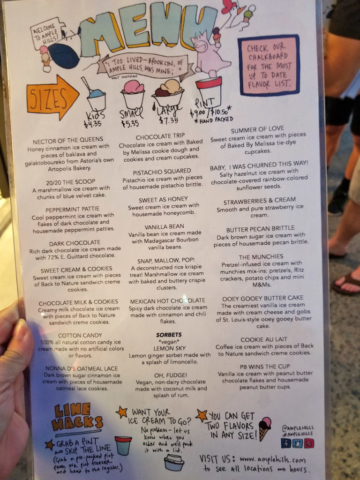 A line wrapped around the building while staff members brought out samples of the new 20/20 flavor, which has a marshmallow taste and a cotton candy swirl. Our trusty taste-testers came back after dinner to find the line still long. They opted for scoops in cups and sat in one of the few booths in the front window. One taster thought it will make a great place for first dates! 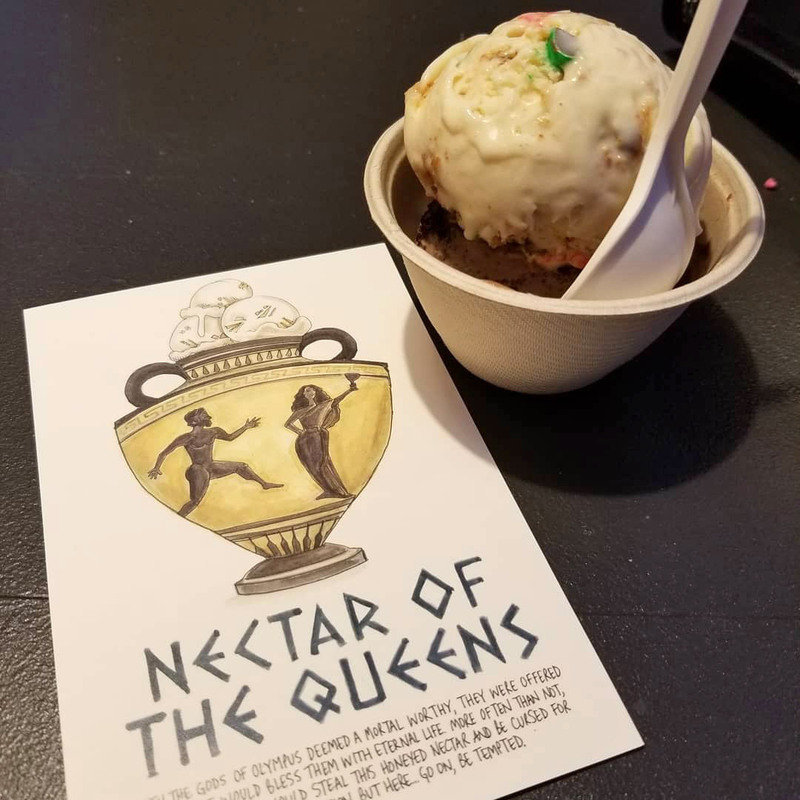 The new Astoria inspired flavor, Nectar of the Queens, made with local baklava, tasted like a sweet Greek goddess. The classic Peppermint Patty had a refreshingly clean taste. The Munchies flavor was good, but adding the Chocolate Trip made for a delightful pairing since you can pick two flavors to put in a cup. The line was much shorter the following day once normal hours resumed. A tip from the couple behind our group in line: Divide and conquer. 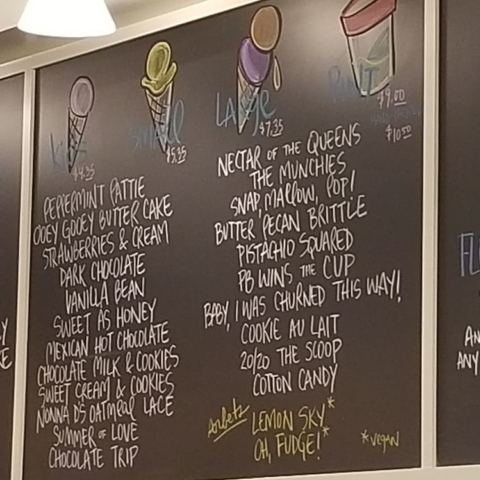 Ample Hills and Chip (30-06 34th St) are across the street from each other. One person picked up cookies at Chip and the other was waiting to buy ice cream at Ample Hills. Sounds like they had a sweet sandwich! 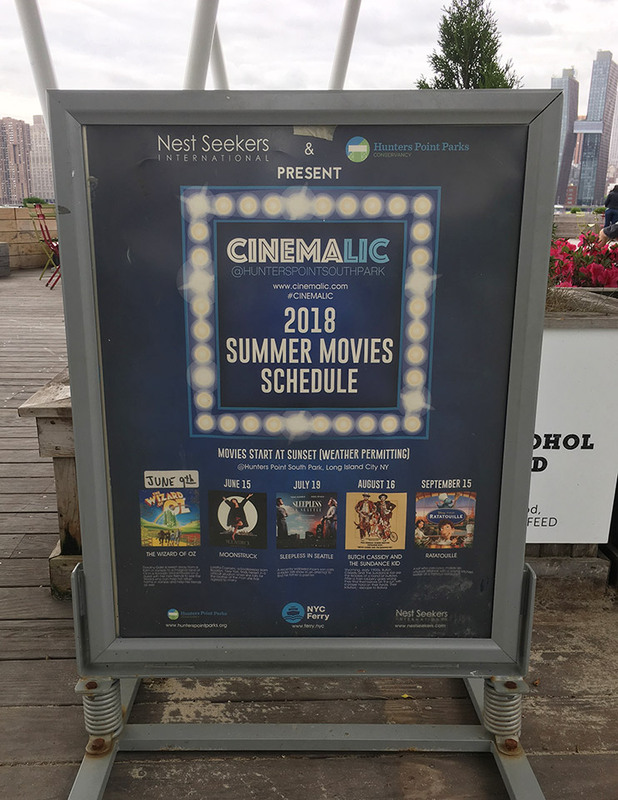 It’s June, and that means this month outdoor movies are starting in Astoria Park and Hunters Point Park South, by the LIC ferry station. All movies begin around sundown. 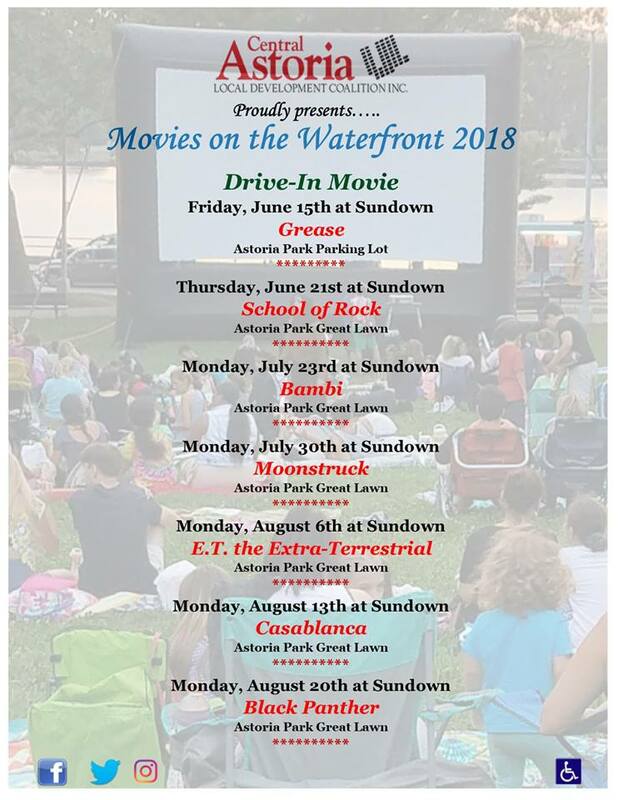 After that the movies are shown on the Great Lawn.